September 25 2014: The Board of the Haliburton County Food Centre decided to change the temporary name of Haliburton County Food Centre to the new name of Minden Community Food Centre. Although the purpose of the building has not changed; especially with regard to being a hub in Haliburton County for food distribution to other area food banks, the new name better reflects the geographical location of the building and reduces confusion with the food bank in Haliburton Village under the direction of the 4C's (Christian Community Concern Centre). 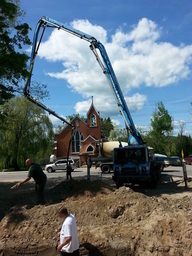 June 1 2014: Footings are being poured for the new addition that will become the Haliburton County Food Centre. When complete, the HCFC will have a new community kitchen, meeting space, increased dry, cold and freezer space. The HCFC will assist other County organizations by acting as a food acquisition and distribution hub. The large storage space will allow us to bulk buy product and take large quantity donations which we often have to pass up due to a lack of space. The Minden Masonic Hall, in collaboration with the Minden Food Bank, has received $150,000 from the Ontario Trillium Foundation, to build an addition to the Arcadia Lodge in Minden that will house the new Haliburton County Food Centre (HCFC). The Food Centre will house both the Minden Food Bank and new community kitchen. The new building is located at the current site of the Arcadia Lodge on Newcastle Street in Minden. The first phase, recently completed, saw the current Arcadia Lodge set in back in place on the newly constructed lower level built last fall. This lower level is part of the increased storage area of the new HCFC. Thanks to the recent Ontario Trillium Foundation funding announcement, the second phase has started and will see a 4600 sq ft addition to the current building which will house office space, a commercial kitchen area, integrated meeting space, accessible washrooms and other support facilities. The Minden Food Bank, in partnership with the Arcadia Lodge have broken ground on a new Haliburton County Food Centre facility which, when complete, will allow the Food Bank to provide better services and programming to its clients and to the community of Haliburton County. The new building is located at the current site of the Arcadia Lodge on Newcastle Street in Minden. Space on the site was offered to the Minden Food Bank by the Masons to allow them the opportunity to build a more sustainable facility. Phase One (COMPLETED): Will see the replacement of the stone foundation of the Lodge with a new insulated concrete foundation. This area will become the storage area (walk in fridge/ freezer and dry goods) for the food bank/food hub operation of the Centre. The level entrance of the storage area will make it fully accessible and allow for convenient loading/unloading of food. Phase Three will see the installation of kitchen equipment necessary to offer a Community Kitchen facility that will compliment the flexible meeting/teaching space and work areas. If you would like to donate to support this project you can make a cash/cheque donation or donate online. Tax receipts are available. Thank you for your support! Thank you to the Council of Minden Hills for their $10,000 contribution to our project. We sincerely appreciate your support as we progress on our mission to provide better facilities to really help people that need it. We greatly appreciate the support of the Haliburton County Development Corporation. Their valued assistance gave us the start we need to bring the Haliburton County Food Centre project to life. We cannot say enough about how valuable they are to this project and to Haliburton County. Having a facility in our County that takes a collaborative and proactive approach to providing people in need with additional, healthier food options as well as valuable learning opportunities is an important step forward against the issues of hunger in our communities. We are taking that step with this project. 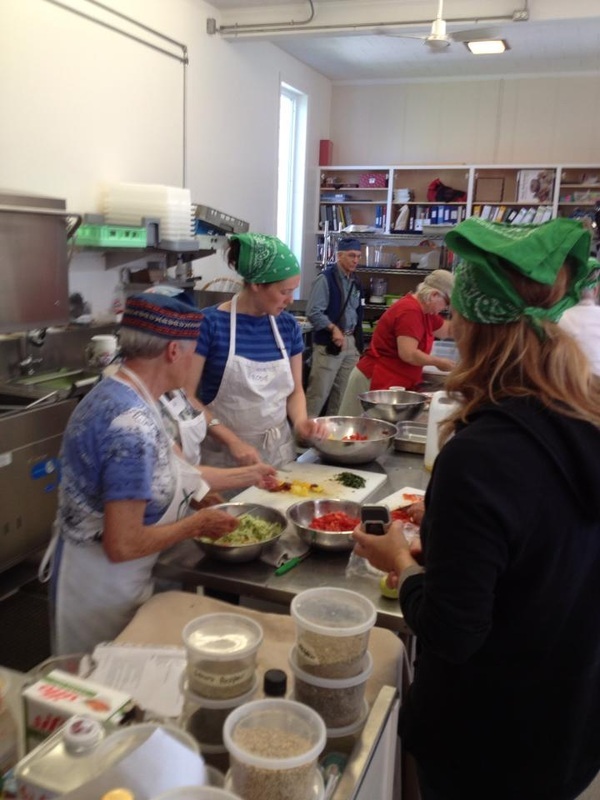 Providing more opportunities for people who are food insecure with healthier food in a manner that maintains dignity, builds health and sense of community. Providing a welcoming place where anyone can enjoy nutritious food, socialize with others and access information on community resources. Providing additional opportunities to receive and distribute fresh, locally grown produce through increased fridge and freezer storage capacity. Providing opportunities for partner organizations to bulk buy products or take advantage of large quantity donations that in the past they (because of limited storage space) could not. Partnering with food banks, community gardens, local businesses and other agencies in Haliburton County to help anyone who is food insecure. Providing an opportunity for anyone to learn food skills such as the nutritional benefits of growing and preparing your own food. 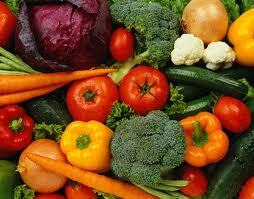 Increased capacity for the acquisition and storage of fresh produce and other perishable items. The ability to act as a food hub to assist the other County food banks and partner organizations. A full sized kitchen and attached meeting space will allow the food centre to offer various educational programs as well as prepare meals for clients.